Constatine's height and style both towered on Queen Street West. "I love really warm colours and vintage pieces. I'm all over the board." It's also an exciting milestone for TorontoVerve. 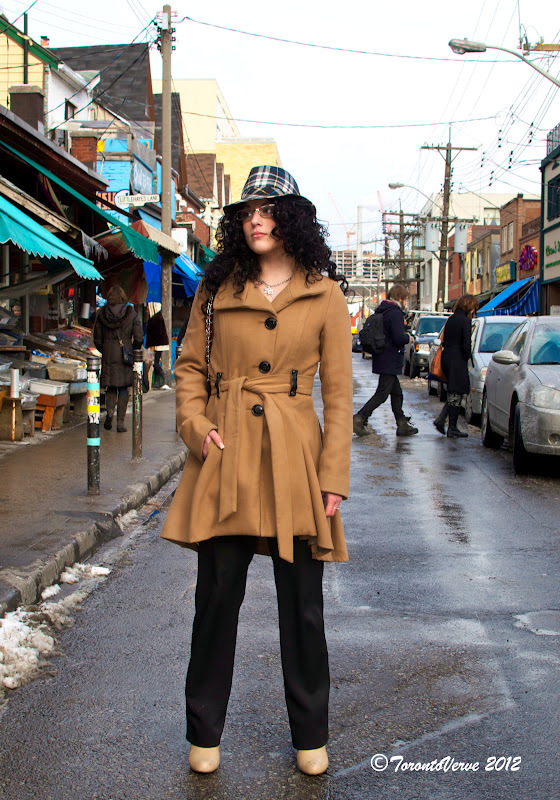 Constatine marks our 1000th street style post! Kat (left): "I love 60's & 70's vintage fur. Twiggy's my role model. I like mixing and matching vintage pieces with new. I bought this fur at 69 Vintage on Queen West. The owner - Kealan Sullivan is amazing! She's got some great styles." Madelaine (right): "I like to mix modern pieces with grandma chic. I love both bright colours and muted palettes. My coat is a new purchase at Frou Frou Vintage. I knew I couldn't leave the store without it." Check out Kat's blog Portrait of a Tailored Girl for all-things vintage, including reviews of vintage styles from movies like Boogie Nights and Virgin Suicides. Also, Madelaine's blog, 162Greene, features stories on fashion and food. "I describe my style as boho-glam -- a little bit of boho, but more sophisticated than that." Juli runs a women's fashion pop-up shop called Fitzroy Boutique with her partner Angela. In March, they'll be popping up at the BYOB Bar and Cocktail Emporium, but for a sneak peak of their curated collection, you can check out their blog now. Paul is visiting from Paris. "My style can be described as urban farmer." "My style is best described as Old Lady Glam. I'm totally into vintage." Amanda runs a versatile blog called Burgundy Girls, which features beauty tips, music mixes and film reviews. "My style depends on the weather and today was a good day for not wearing multi-layers. Colour is also very important to me." "I love texture and layers. I also wear a lot of black and mix it up with fur, leather and metal. I take a lot of inspiration from the 80's rocker generation. My coat was made by a designer Sid Neigum -- he's based in New York. It's from his fall/winter 2011 collection." Dwayne is part of a creative group called The Fashion Collective. They represent up and coming Canadian designers. "I really like to mix vintage with a modern aesthetic." Kristiann is a designer and sells PDF sewing patterns through her blog: Victory Patterns -- a fashionable DIY clothing line. I photographed Marq's street style twice before, which makes him the most featured male on TorontoVerve (click here to see). "It's winter so my style can be described as 'warm Northern Italy with a little bit of Montreal'. My bag is from The Leather Market in Florence, the scarf is Missoni from Rome and my jacket is from MO851 in Montreal." Marq currently works as a freelance classical ballet teacher. For more info, check out his site. "My style has a strong retro/vintage vibe as I buy most of my clothing second-hand. Lately, I've been watching a lot of Twin Peaks so I've been wearing plenty of oversized sweaters, headbands and high-wasted pants and skirts. I tend to wear a lot of neutrals and muted tones, but also try not to take myself too seriously - like my Star Wars inspired ensemble today: big drapey sleeves, cowl neck and circle glasses." When I approached this fashionable trio, little did I know that Sonia and Sissel's street style have been previously featured separately on our blog. Small world. During our little photo session, I was impressed to learn about the organization that Parimal co-founded. "It's called Public Displays of Affection -- it's designers coming together to make art and furniture for social and non-profit housing." For more information on this great project, visit their blog. 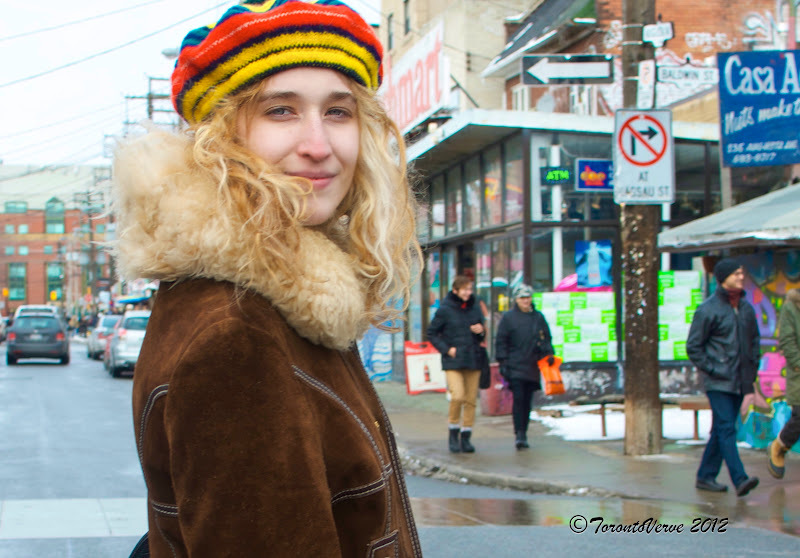 Coincidentally, I shot Hannah's street style over a year ago just a few feet away from this spot in Kensington Market. Funny how fate works. I've been asked why fewer men than women appear on my street style blog. 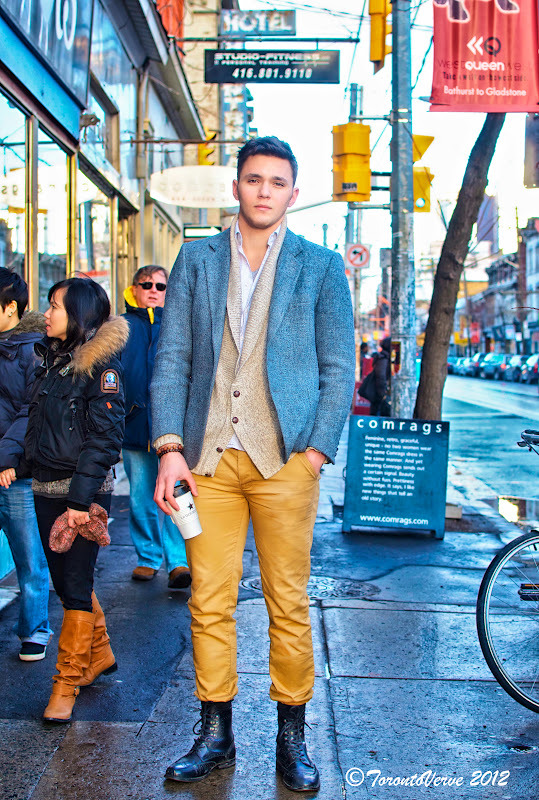 The answer is quite simple: it's hard to find fashionable men in the city. That's the reason why I nearly threw myself out of a moving car after seeing Richard walking through Yorkville. The reckless effort paid off. "I like wearing this suit ensemble because it's sort of a feminine way of dressing up, but people not thinking it is. It's subversive and that's what I like." "Fashion can be fun and it doesn't have to break the bank. 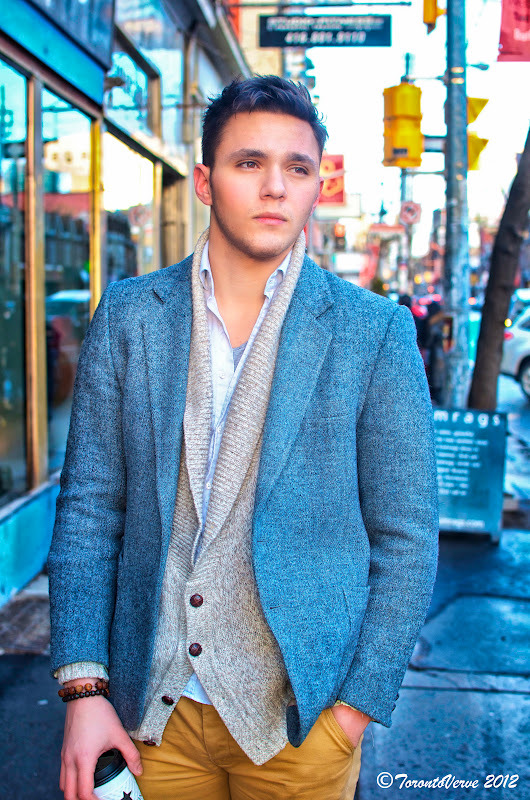 Your sense of style is the power of style, and Canadian males need to get with it fashion-wise! Nothing can stop good looking men with the right clothes." Rebecca: "My style is anything that I can find in either my boyfriend's or my closet. I've been travelling a lot so I have a large collection of things that I've found all over the world." Rae: "My style is mostly a lot of tights because I find them comfortable and I pair them with a lot of collared shirts." "I love to wear a lot of black with high heels." Kim also spends a lot of her time behind the camera as a photographer. Check her 'whimsical' and 'dark' photos on her website: KimAkrigg.com. Tonight, as part of a Black History Month Celebration, TD, Clement Virgo & the Canadian Film Centre paid tribute to one of my all-time favourite actresses -- the beautiful and talented, Pam Grier. As a black adolescent in Montreal, I didn't see many black heroes on TV -- so seeing a young, tough, rifle-wielding Pam Grier on screen was quite the phenomenon. Her action films Coffy, Foxy Brown and 'Sheba-Baby' not only solidified her as a superstar, but left an indelible impression on me. Today, at 43, I still get excited when I see Pam Grier's name in movie credits. After director Clement Virgo presented an epic film reel that celebrated her memorable roles, Grier nervously walked out amidst cheers and whistles from her adoring fans. Wearing a sharp black ensemble, she quickly became relaxed after a few funny exchanges with actress/moderator, Sharon Lewis. The interview covered her successful film career, her experience with racism in Hollywood and her difficult private life. One of the most revealing moments occurred when she shared the story of being raped at the ages of 6 and 18. Despite these excruciating events, she learned to persevere -- even when she had to recreate the brutal acts on film. In fact, Grier used her real-life trauma to bring realism to her characters' devastation. When asked about racism in Hollywood in the early 70's, Grier didn't hesitate to say that she harboured no resentment. "As black actors, we were happy to be on this maiden voyage in cinema." Grier amusingly shared that black stuntwomen didn't exist in her time; instead, producers resorted putting black make-up and padded bras on "skinny white men" to double for her. Grier credits indie-director Quentin Tarantino for resuscitating her career in the 90's. "I met him in the street and couldn't believe that the guy who directed Pulp Fiction couldn't afford shoes." During that chance meeting, Tarantino informed her that he was writing a pivotal part for her in his latest film, but she wasn't convinced. Later, she was shocked to find a script for Jackie Brown in her mailbox. To her astonishment, Tarantino kept his promise and for that, she will always be grateful. When the topic of today's female black action-stars came up, Grier quickly saluted Star Trek's Zoe Saldana and Mission Impossible 4's Paula Patton for their fine work, but she refuses to take credit as their trailblazer -- even after Lewis insisted. What's next for the iconic actress? Soon, she'll be the subject of a film, based on her life and book "Foxy: My Life in Three Acts" and she'll appear in a Coffy reboot.